Anybody who owns a home and personally conducts their own renovation has a special tool in their stash, capable of any number of situations: a drill. Getting a cordless drill makes it even easier to use and allows its user to carry it around from place to place with ease, making renovations in parts of the home even when there is currently no outlet to plug in the tool. 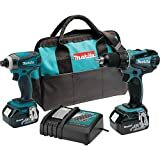 Makita is one company that has made a profound presence in the industry, offering several different drills for homeowners to pick from depending on their needs. 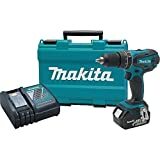 Following is our list of the top ten Makita cordless drills it will be able to handle jobs like putting up shelves, and for drilling through wood, building flat pack furniture etc. That is the types of jobs these drills tend to accomplish. 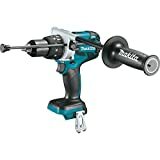 The drills in this review are designed for jobs like putting up shelves and drilling through wood. 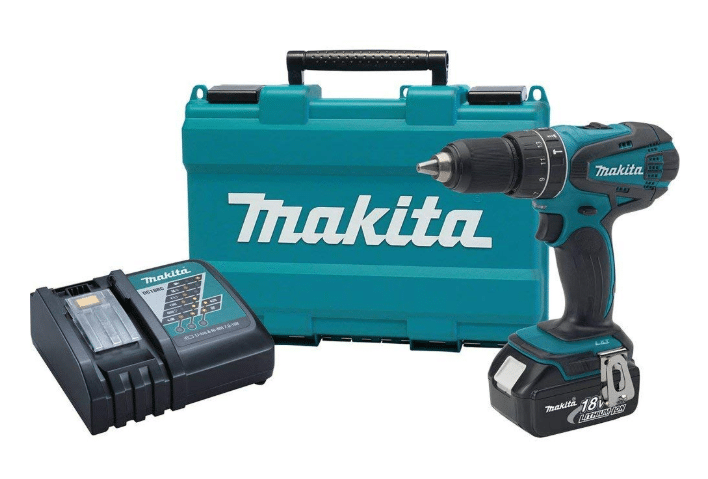 We have looked at Makita who are industry-leading manufacturers in this sector. This is evident of all the positive feedback they get from all their customers who have used their products before.8You really cannot go wrong with either one of these drills. The power and quality are bar none. Great things come in pairs, so here you get a Makita XFD01 cordless drill and Makita XDT04 impact driver. It has a variable two speed of 400 and 1500 revolutions per minute on the drill. The impact driver has a variable speed of 2300 low and 3200 revolutions per minute high. The 4-pole motor delivers a remarkable 480 in.lb of maximum torque. 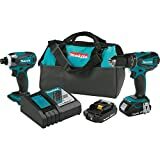 Both the drill and driver are rated at 18 Volts. Two 2.0 Ah batteries are interchangeable among the devices. The batteries charge fully in about 25 minutes letting you work longer. The design ergonomics lets you access hard to reach areas. The drill and driver have superior battery life when compared to other 18 volts variants. In addition, the fast charger contains a fan increasing the lifespan of the battery. Led lights above the trigger can assist in low light conditions illuminating the work area. The Makita XFD10R has 2-speed transmission of either 600 or 1900 RPM. A 4-pole motor supplies a maximum torque up to 480 in. lbs. The weight is reliably distributed prevent exhaustion on the operator. L.E.D lights built into the drill illuminates the work area in dark spaces. A rubberized grip provides improved handling of the drill when in action. Extreme protection technology (XPT) gives extra protection to the Makita XFD10R from dust and water in unforgiving work conditions. The Makita XPH07Z LXT Lithium-Ion driver drill gives an outstanding 1090 in.lbs of torque. You can use the tool in challenging drilling and driving on wood, masonry, and metal. 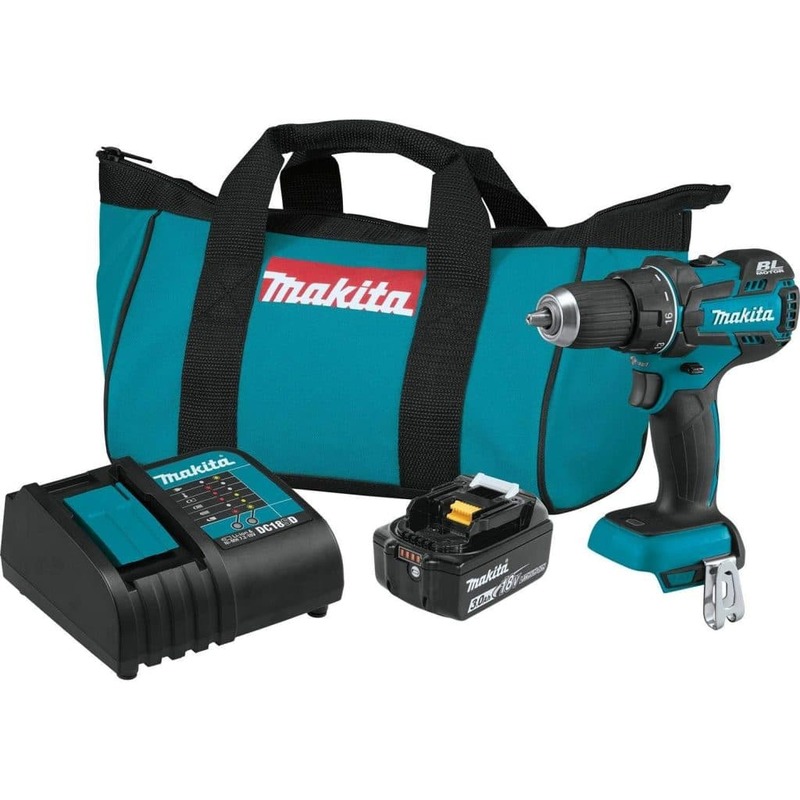 Powered by Makita brushless motor, power and speed are subsequently increased. The brushless motor also makes the tool durable. The Makita XPH07Z is an immaculate addition to any toolbox or tool belt. 18 Volts LXT lithium ion 4.0 Ah battery reaches a full charge in about 40 minutes. The FD02W weighs only 2.2 lbs. (with battery), and delivers both power and pro in an ultra-compact size for a variety of drilling and driving needs. 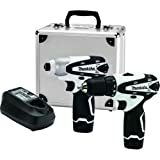 This commanding cordless driver-drill is built for maintenance professionals, repair people, remodelers, electricians, cabinet installers, and any general contractor seeking an ultra-compact cordless driver-drill. The FD02W features a Makita-built variable speed motor that delivers 200 in. lbs. of maximum torque and 0-350/0-1,300 RPM. 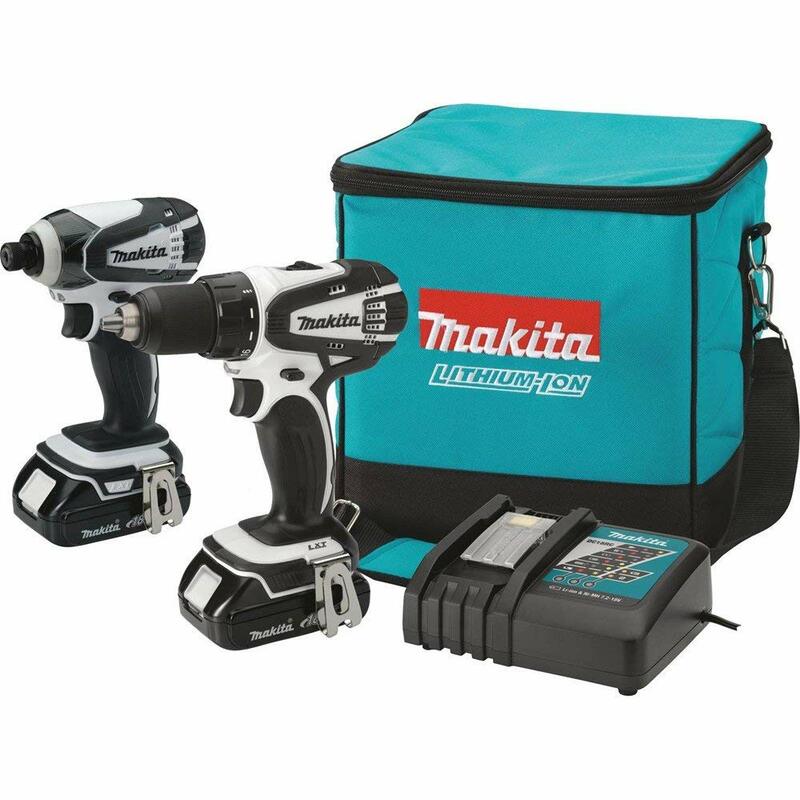 The Makita XT273R kit contains the XPH01Z hammer drill, the XDT04Z impact driver, two 18V batteries and a charger. The Makita XT273R has XPT protection against moisture and dust, plus Star Protection Computer Controls against overheating, overloading, and over-discharging. The 2.0 Ah lithium-ion batteries recharge in only 25 minutes. The Makita XT273R has 2-speed transmission of either 400 or 1500 RPM. A 4-pole motor supplies a maximum torque up to 480 in. lbs. The bill is inexpensive in view of all the functionality you get out of this cordless drill. Service bag included to store all the tools. The built-in status indicator shows battery level. 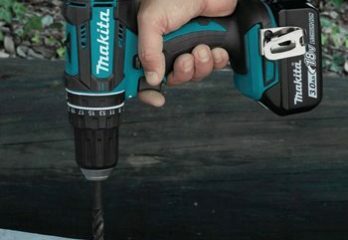 The Makita XPH102 comes bundled with a single 3.0Ah battery and a fast charger. 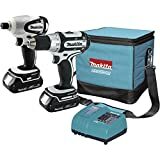 The drill has two-speed transmission of 600 and 1900 revolutions per minute the impact driver variable speed is controlled by how hard you pull the trigger. The drill works effortlessly to accomplish high quality works. Extreme protection technology (XPT) offers better dust and water resistance making it a good option to work within harsh conditions. The Makita XPH102 Comes with a high-quality case. The case has an allowance of another extra battery too. You can use it as a percussion hammer. With the Makita XT601 Combo Kit, you get yourself a real bargain as the kit compromises of high-performance tools at an affordable price. These tools include the 6 1/2-inch circular saw that offers fast, hassle-free cutting thanks to its 3,700 RPM, 4 1/2-inch cut off/angle grinder with a notable speed of 10,000 RPM, 1/2-inch hammer driver-drill with a variable speed of 0 to 1,500 RPM and a torque of 480 in.lbs. Adjustable impact drill with of either 2,300 or 3,200 RPM. With a maximum torque of 1,420 in.lbs. With this, you save money by getting all of the devices at one time. All the tools are cordless increasing their movability when at work with any. 4-position Xeon bulb flashlight for use when working in poorly lit areas for added convenience. Reciprocating saw that makes knocking down stress-free. Carrying/storage bag with wheels provided for. Both the driver drill and impact driver in this Makita combo kit provide adjustable speeds. The driver-drill provides a maximum torque of 480 lbs. The variable speeds available for this power tool are 0 to 2,300 RPM and 0 to 3,200 RPM with 1,420 lbs. of maximum torque. The tools here were made for medium jobs to be completed in haste. 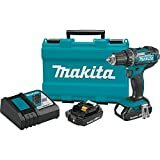 You get two Makita tools for a short price on top of that. Two 3.0 Ah batteries are included reducing downtime. In addition, the batteries charge fully in just 30 minutes. 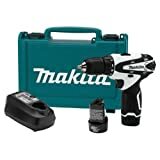 The Makita LCT209W 12 Volt Combo kit, gives you a drill and an impact driver.This is a variable 2-speed drill. It contains a keyless chuck that delivers 200 inch/lbs. of torque. The drill weighs 2.2 lbs. has a good hold thanks to the rubberized handles. This type of drill is ideal for using around the household. It is lightweight and compact. In limited spaces, the drill works without a hassle. It also comes with a convenient LED work light. You get two batteries that are lithium ion 12 volts capacity. A fast charger fills up the battery in just 30 minutes. 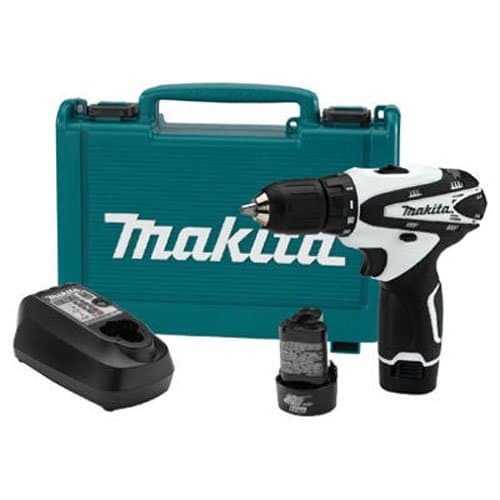 The batteries can be used in either the drill or the impact driver interchangeably. Nice-looking aluminum case to store the tools and accessories when purchased. The impact driver with a torque of 800 Lbs. complements the drill. You can use this drill as a screwdriver too. When looking for small and powerful, you can get this Makita XPH012 cordless drill. It has a variable two speed of 400 and 1500 revolutions per minute. The 4-pole motor delivers a notable 480 in.lb of maximum torque. You can use this drill as a hammer driver too. With up to 6000 blows per minute. The ergonomic shape lets you access hard to reach areas. The drill and driver have longer battery life when matched to other 18 volts variants. Star Protection Computer Controls to prevent overheating, overloading, and over-discharging. The material used: An all-metal design means a much more powerful drill. This also gives more lifespan where metal is used instead of tough plastic. Power: Look at the power rating in the drill. In this review, we have looked into detail the level of force the specified drills can achieve. Ensure you get a strong enough drill for your needs by looking at revolutions per minute or other indicated in this review. Price: The prices have been considered in this review. We have looked at what is offered and what you pay. We ensure with a measured level the product on offer with all its features and the cost of the drill. Get a drill that is capable of handling the work put forward and the price attached to it. Extra features: Some of the features in Makita drill are truly opportune and delightful. We have highlighted some of the outstanding properties of the said products in this review. Battery: Look for a battery that is sustainable and can finish the work as put out for it. A higher battery capacity means you can spend more time working than spending on charging. If you cannot, you can always get yourself an extra battery from Makita. We recommend boosting your workflow with the extra batteries. Just for added convenience. For portability: Cordless drills are easy to move around from place to place. Wires do not restrict one’s movement when working. You get a lot of freedom to access areas where power may also be a concern. Letting you get to drill hard to reach areas. Work smarter: With a cordless drill, you can get work done much cleaner and more efficiently. 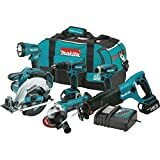 With this kind of power tools in this review, you get to finish your work much faster than using traditional means or tools.They are light and easy to handle, yet you have plenty of power when you need it. For hard to reach areas: the drills in this review are all ergonomically designed for those hard to reach areas. 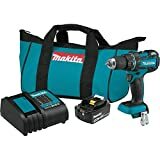 You can infiltrate into them easier using this Makita tools rather than traditional tools. 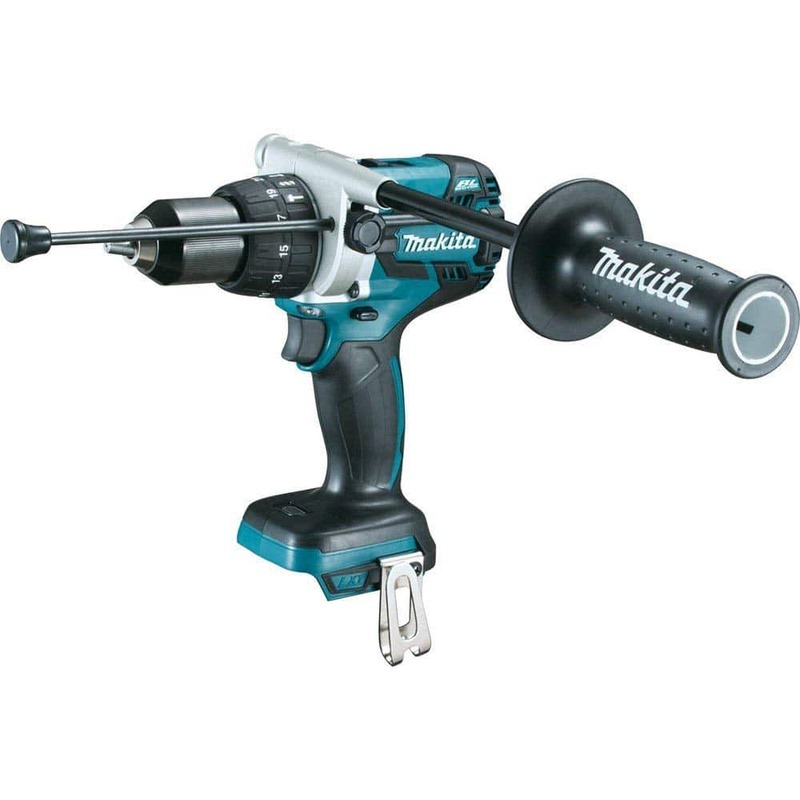 The drills from Makita are made with high quality for durability and sustainability. It is telling that most of their products have a three-year warranty. They tend to innovate and raise the bar for others to follow. 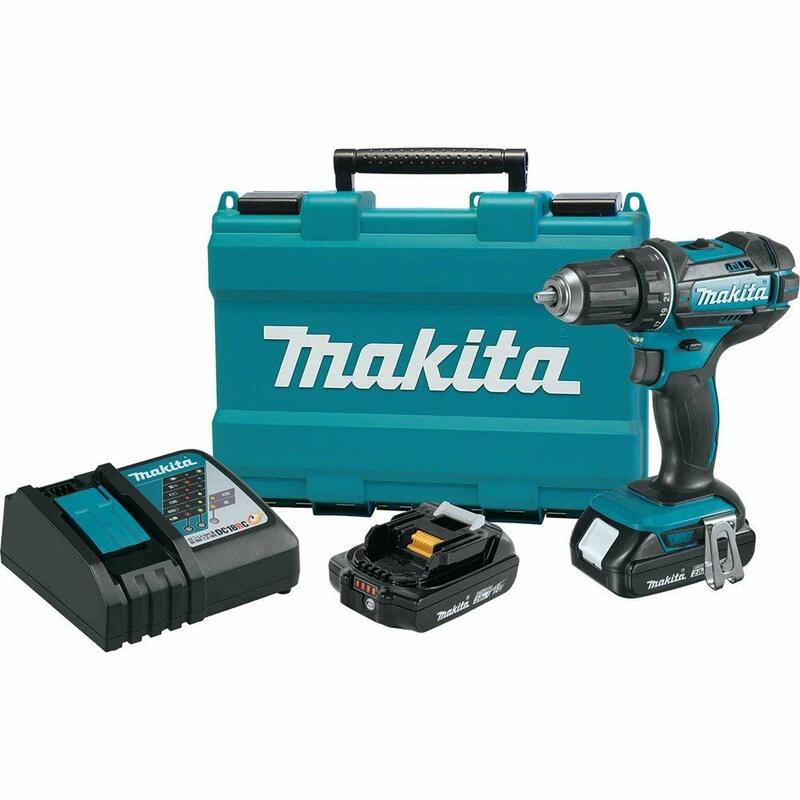 With Makita, their level of quality in their devices is never compromised.